Kuvale Khadi is a popular traditional Konkani sweet. In Konkani, Kuvale means ash gourd and khadi means burfi. This burfi was commonly distributed during special occasions like marriage, house warming etc. Slowly other sweets are dominating this tasty burfi. This sweet has a very different taste and texture. It's my mother's favorite sweet and of course mine :-) (as always). 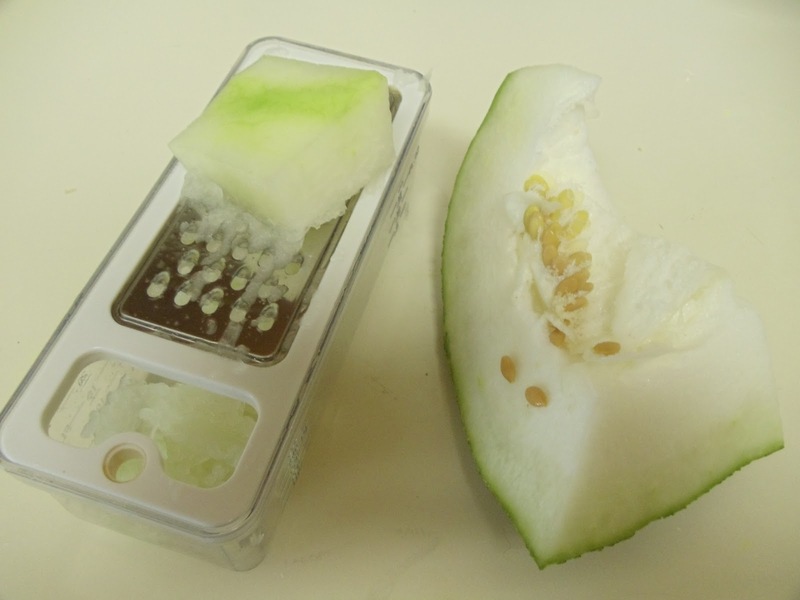 Remove the seeds and peel of the Ash gourd. Then grate it. You will see lot of juices released while grating. Now put the grated ash gourd in a strainer until most of the juice is drained. Collect the juice in a bowl. Now measure the grated ash gourd (I got 2 cups). Now take the grated ash gourd along with the juice in a wide pan (Non stick would be great). Start heating it on a medium flame until most of the moisture gets evaporated. Once done, add the raisins and cashew nuts. Then add the sugar. Mix well and the mixture now turns on the liquid side. Now add the ghee and food color. Continue to heat this mixture until all the moisture gets evaporated and forms a sticky mass. At this stage add the crushed cardamom seeds and mix well (to know the end point add a small amount on a plate and if it hardens after few seconds then its ready. For me it took a total of 50 min for the entire procedure of cooking). Transfer the mixture to a greased deep dish (I used a loaf pan). Spread it immediately (I used a small steel bowl). Then cut the burfi into desired shape before it hardens. Allow it to cool for half an hour. Then remove it carefully with the help of a knife. Store the burfis in an air tight container. Above measurement makes 10 good sized pieces. Vow.Lovely step by step recipe.I too have the book by Jaya V shenoy.Now I will surely try this recipe.